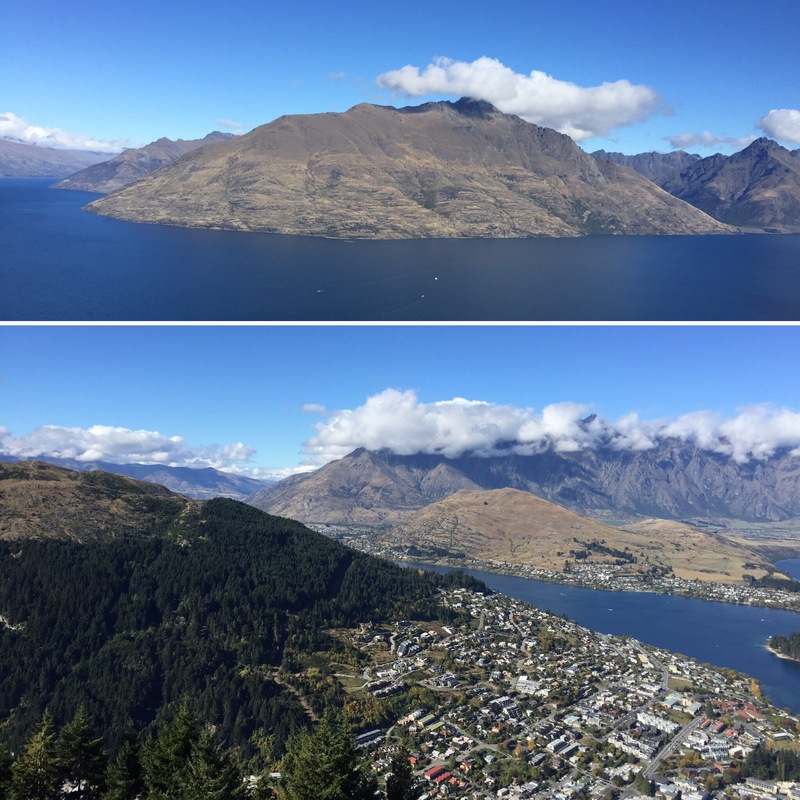 On the 15th April 2017 we were on our way to Queenstown, the adrenaline Capital of New Zealand, probably even the Southern Hemisphere! 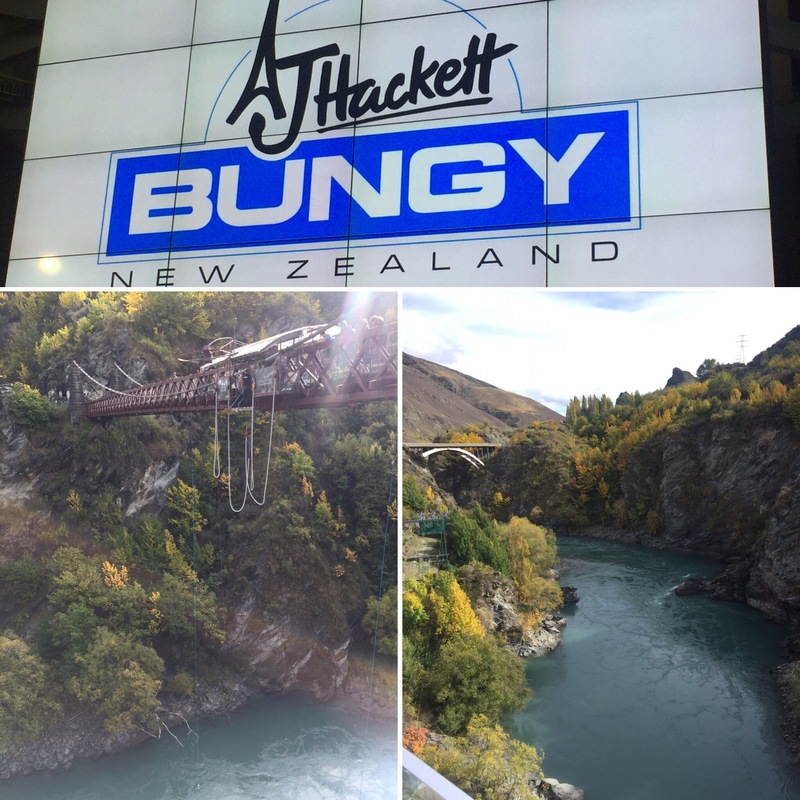 Our first stop was to the Kawarau Bridge Bungy where some people from our bus had booked to do some bungy jumping and zip lining. 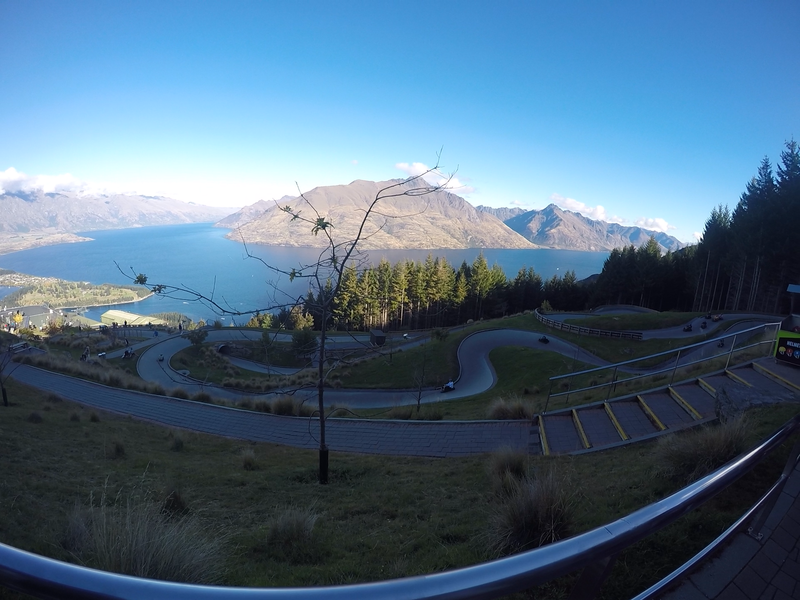 As this was on the way, we waited around for everyone who was waiting to do their jumps before we headed into Queenstown. 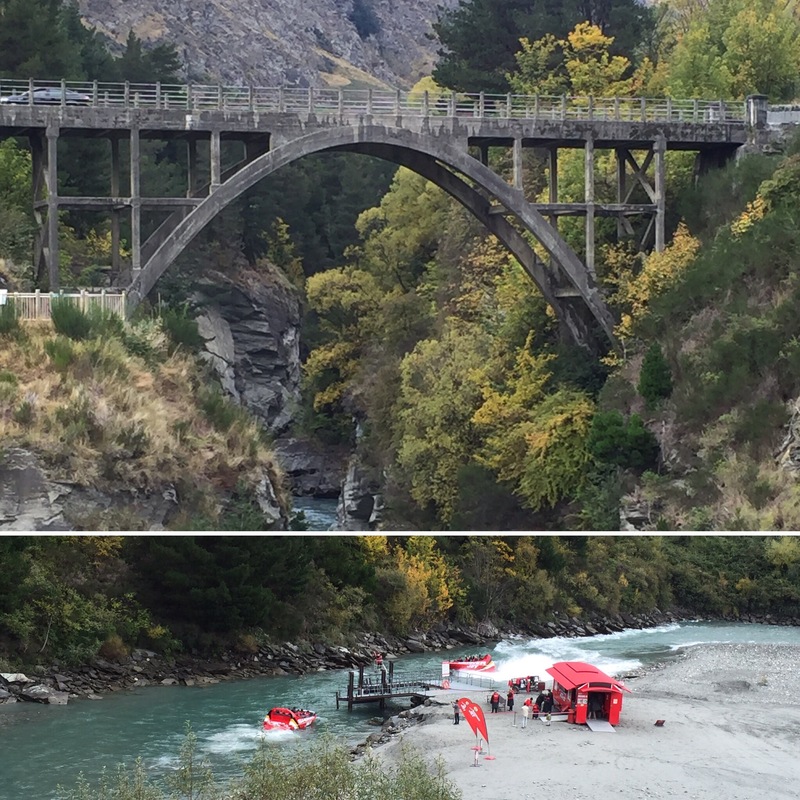 Kawarau was the birth place of the bungy jump so we were shown a video on how bungy began. AJ Hackett invented the modern day bungy after seeing people in the South Pacific performing a form of bungy in ‘coming of age’ ceremonies. 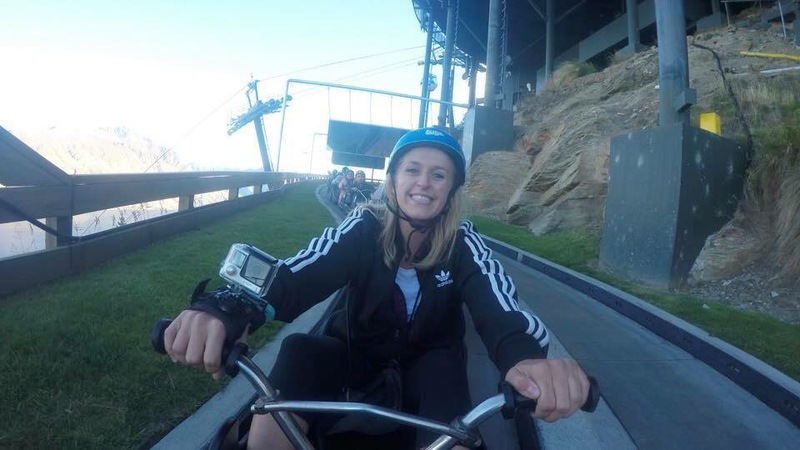 In his pursuit of the best places to bungy (and in the name of publicity) AJ Hackett snuck up the Eiffel Tower, slept there over night and then jumped off it the next morning. He has also jumped off a range of bridges, off the tops of buildings and out of a helicopter! It was scary to see the people doing this bungy seeing as the one we would be doing will be three times the height! 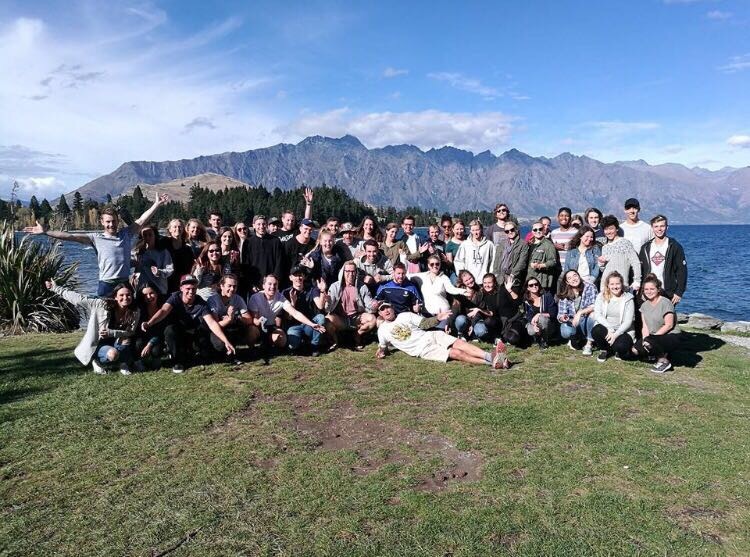 Once we arrived into Queenstown, we stopped by the lake to get a group photo of all of us from the Kiwi Experience bus. 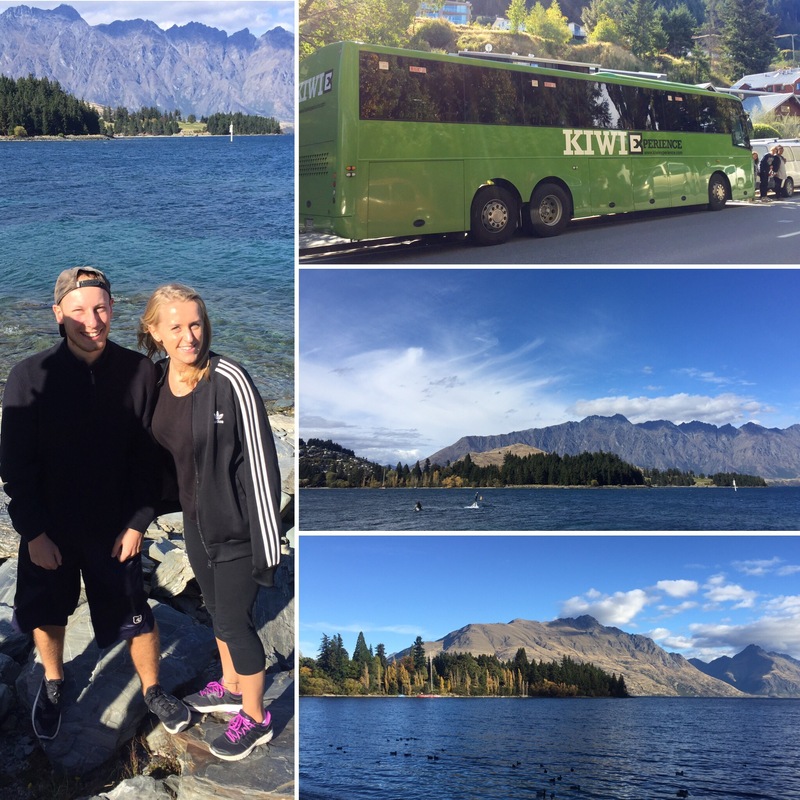 Queenstown was our last stop all together as everyone was spending different amounts of time here or moving on to different places – we were going further south, the girls were flying out to Asia and everyone else was continuing along the Kiwi Experience route on different days. 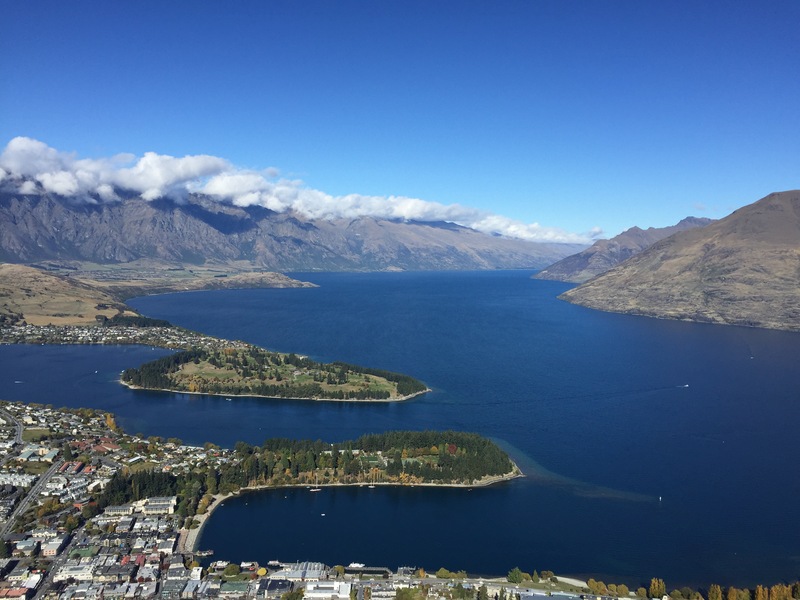 Queenstown is beautiful. The place overlooks an enormous lake which is surrounded by the Remarkable’s Mountain Range. It reminds me of an alpine ski village in France which isn’t surprising considering it becomes a ski town in winter. 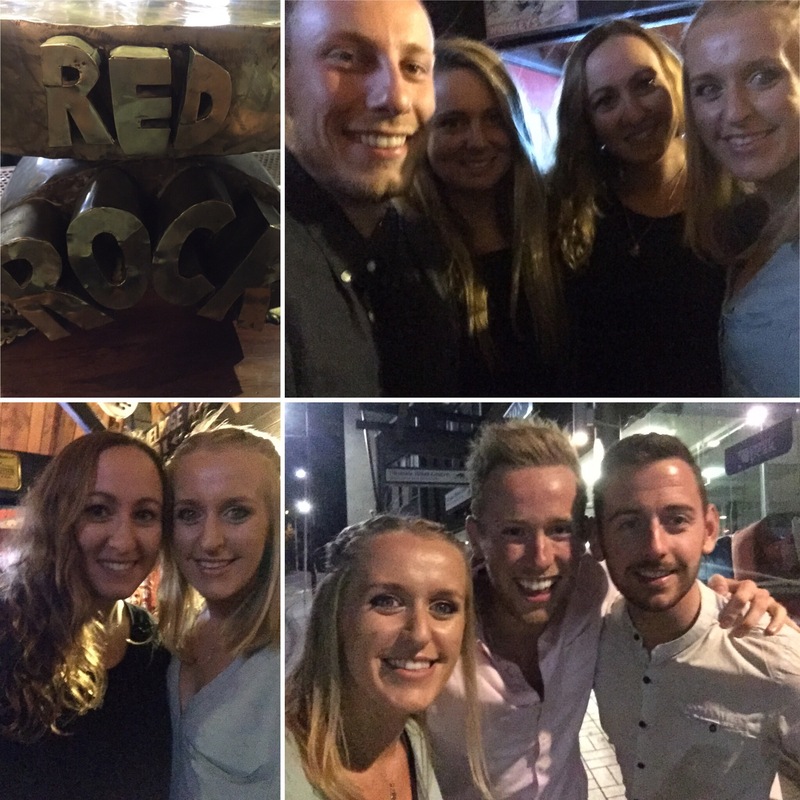 On our first night out we had paid to have a meal with our bus at a pub called Red Rock. 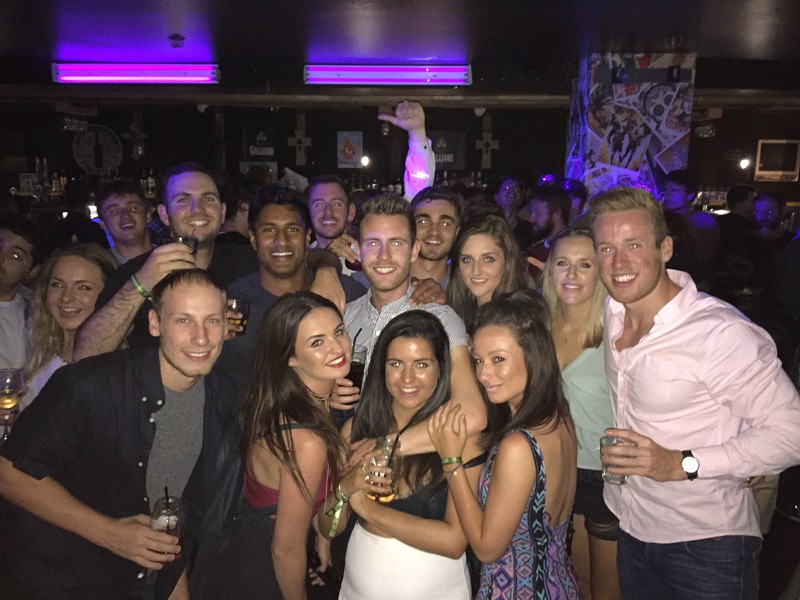 It was Pierre’s birthday (someone from our bus) so we all went out afterwards to some more bars which was fun. 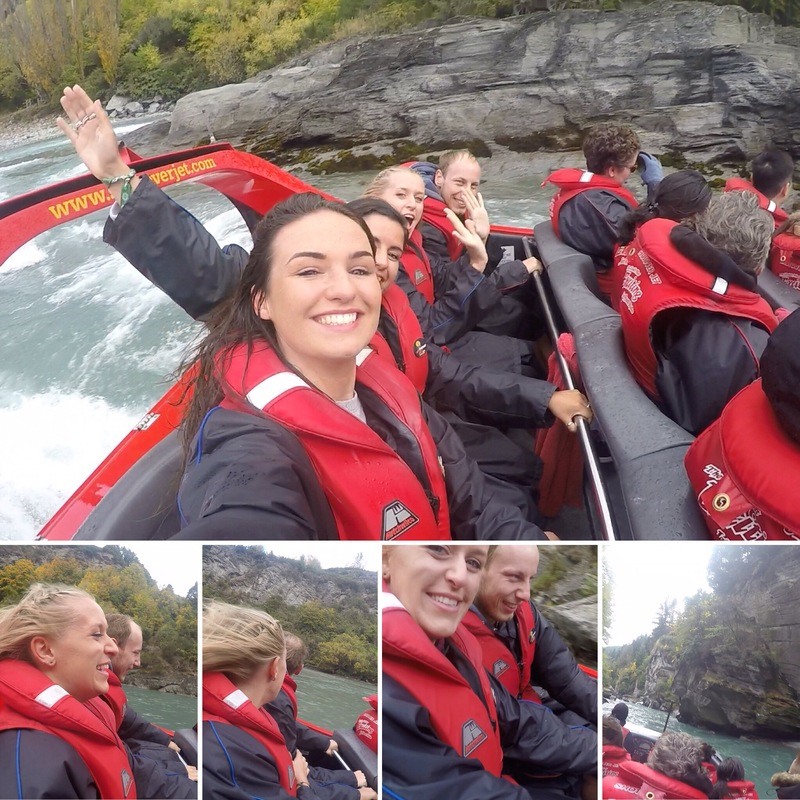 The next day, we had booked to do the Shotover Jet with James, Bethany, Laura, Megan and Annie. 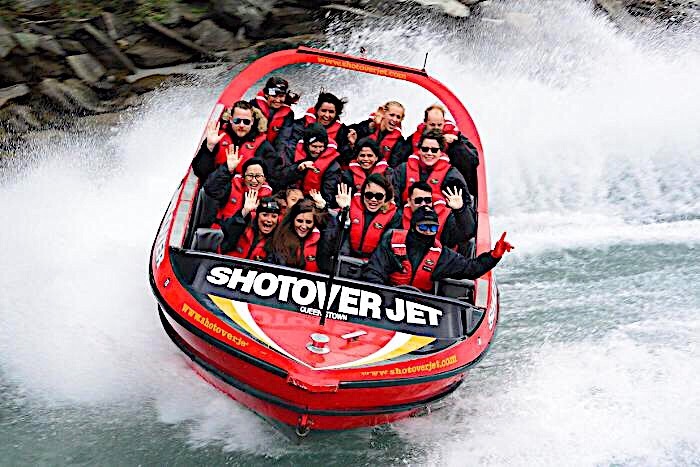 The jet goes to speeds of up to 90mph on a river through a huge canyon. It was for around 25 minutes and it flies you around the beautiful canyon doing 360 degree spins and dodging the rocky walls. 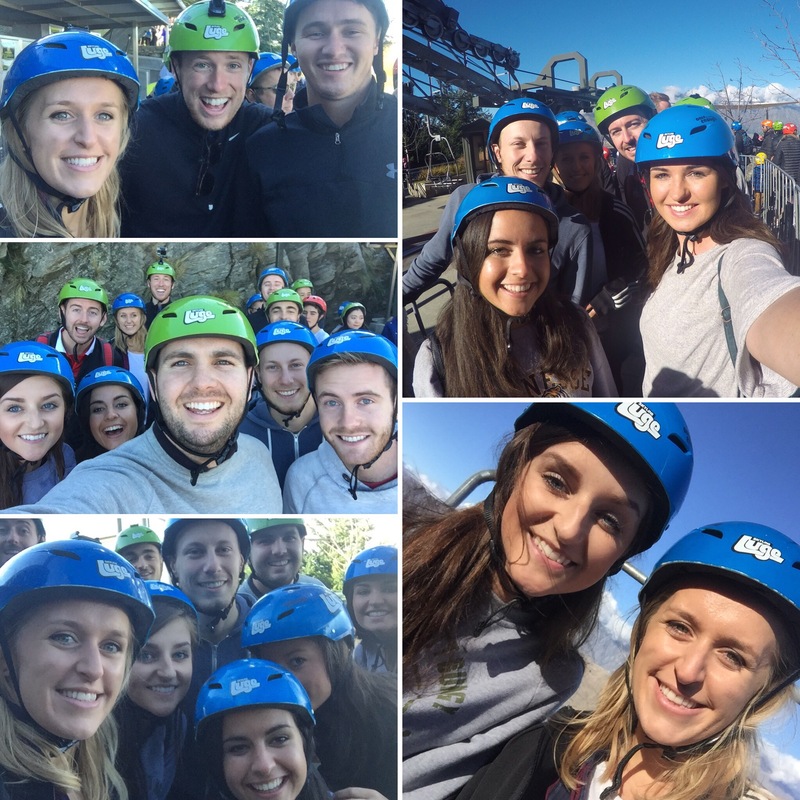 The whole experience was so fun and we all loved every minute of it – I would definitely recommend it if you’re in Queenstown! 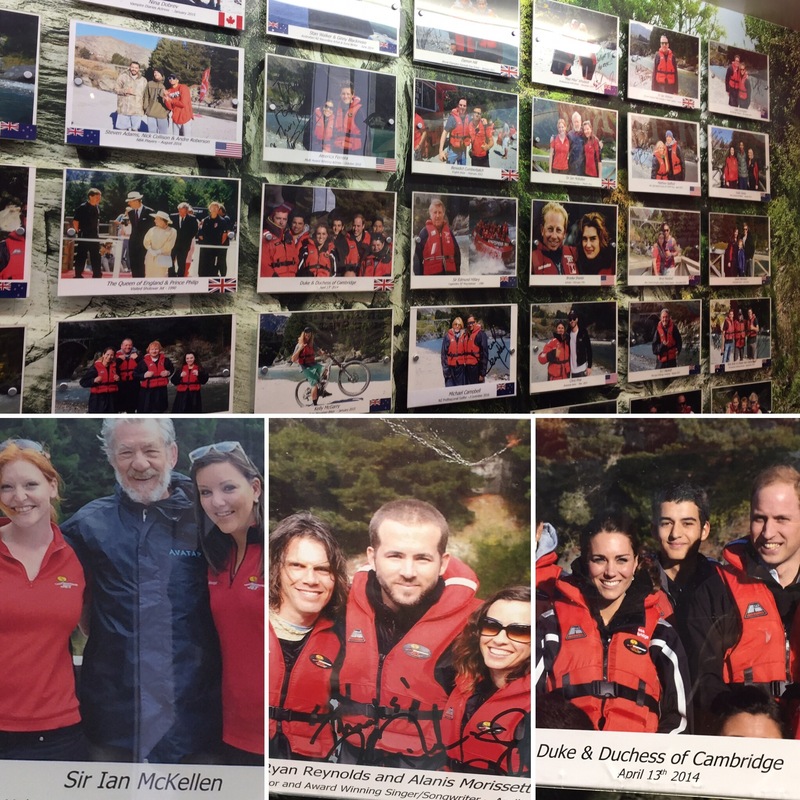 Loads of famous people have also done the jet including Prince Will and Kate – they have a wall of fame and it was so surprising seeing how many people had been on the same boat we had! 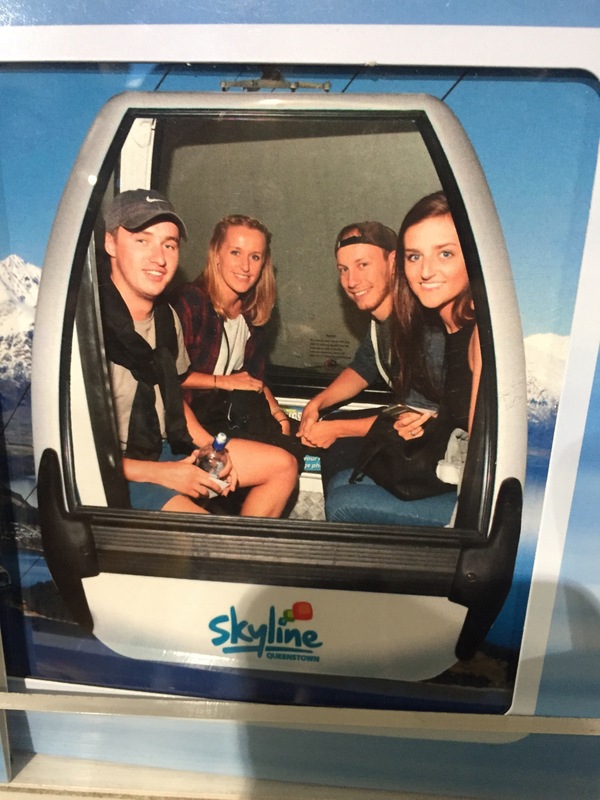 In the afternoon, 12 of us (Niall, myself, Padraig, Keith, Pier, Sam, Matt, Callum, Laura, Annie, Bethany and Megan) all went up a mountain via the gondola to go on the luge. 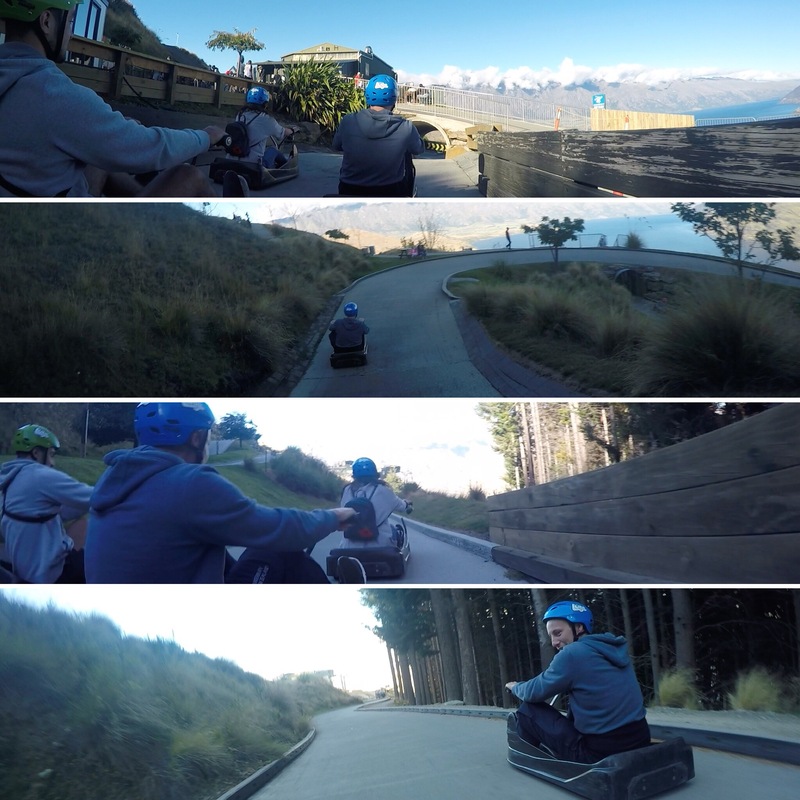 The luge is kind of like a go-kart with no engine where you move the handles to start and stop and role down a track, picking up speed and racing one another. 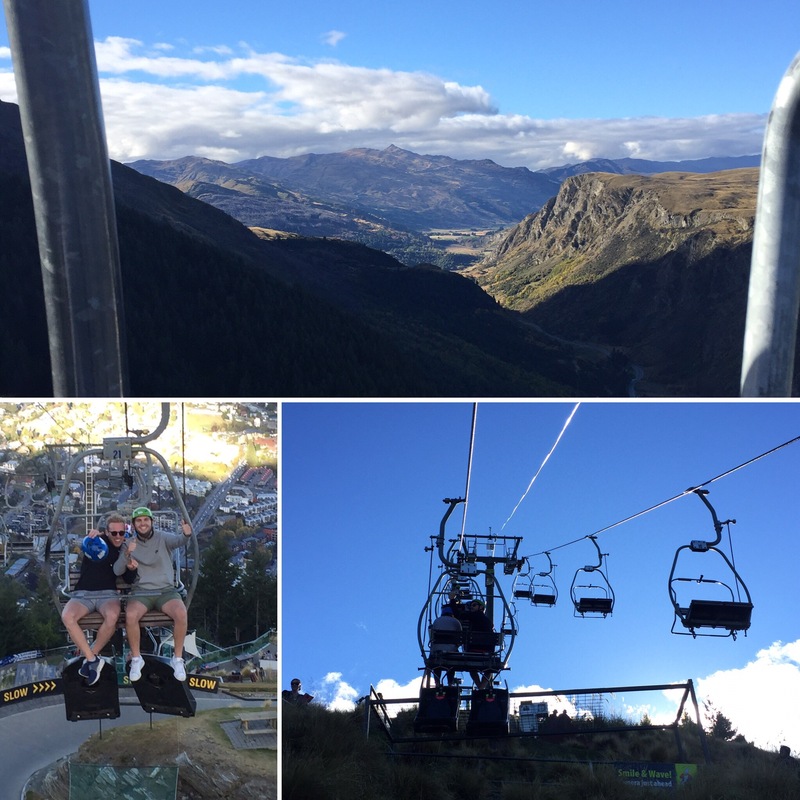 You go up the gondola and then on a chair lift to the top of the track. 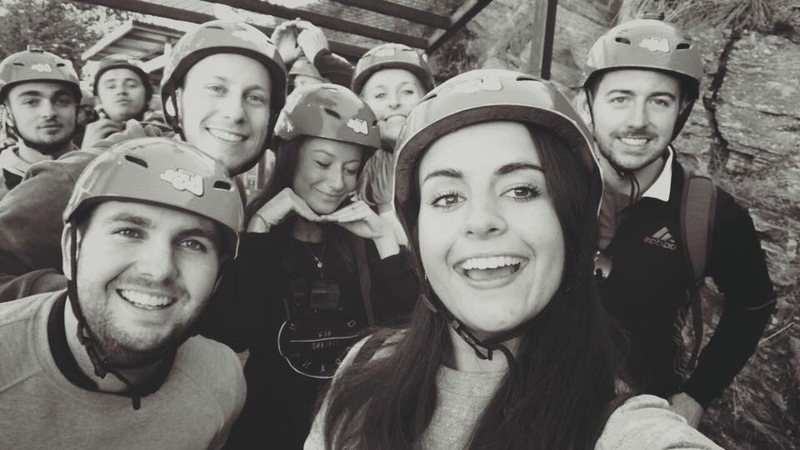 Whilst we were looking at the views from the top of the gondola, we saw our friend, James, about to do his bungy (he had booked it in a spur of the moment that morning) so we waited around to watch him do it. 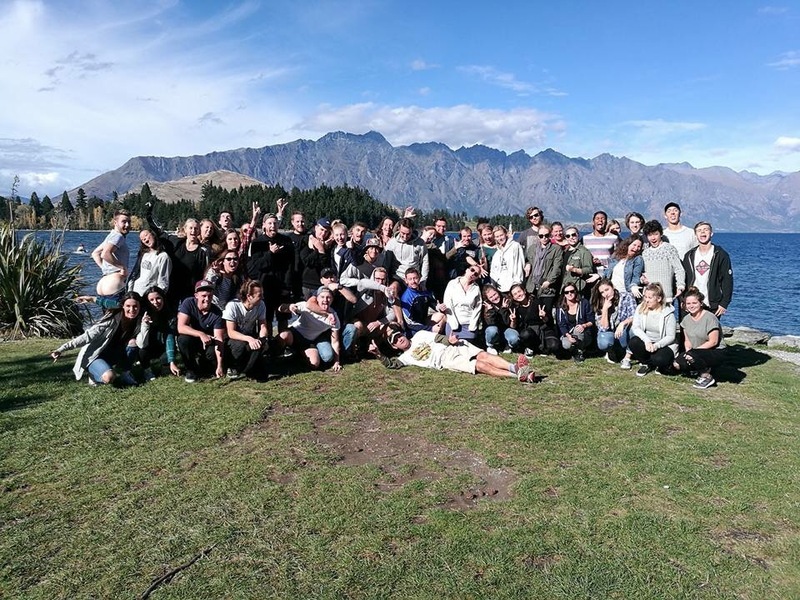 He did the Ledge Bungy (the third type of bungy on offer in Queenstown) and it was cool to see him do it and nice that we could all be there to cheer him on. 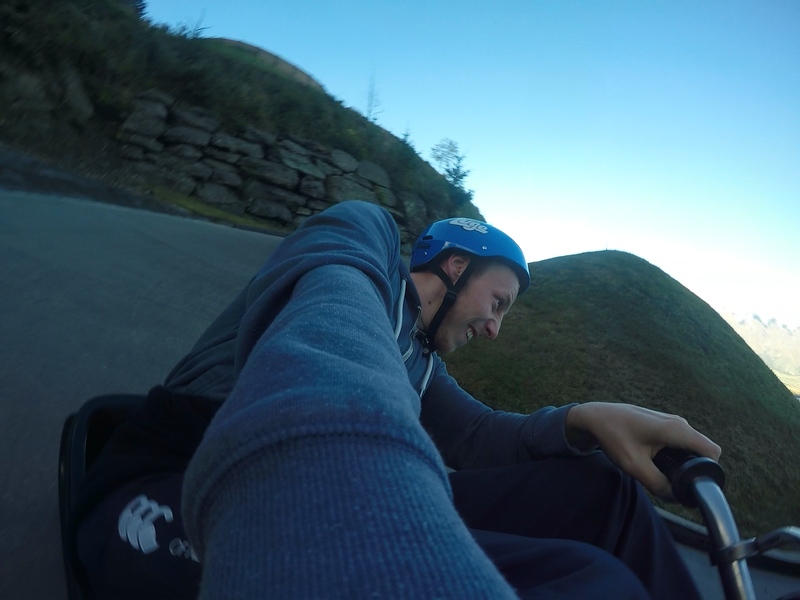 The luge was so much fun! We had 4 races and in the first race we had to go down a different, slower track to practice using the karts. The track was still very fast and, in the first race, it was between me, Niall and Pierre. Niall crashed into a wall which was really funny but then he still pulled it back, overtaking us later. In each race there was something different. On the second race, me and Niall raced and it was our first time on the faster track. This track was a lot steeper with smaller turns so you really flew down it and had to be careful not to tip out on the turns! 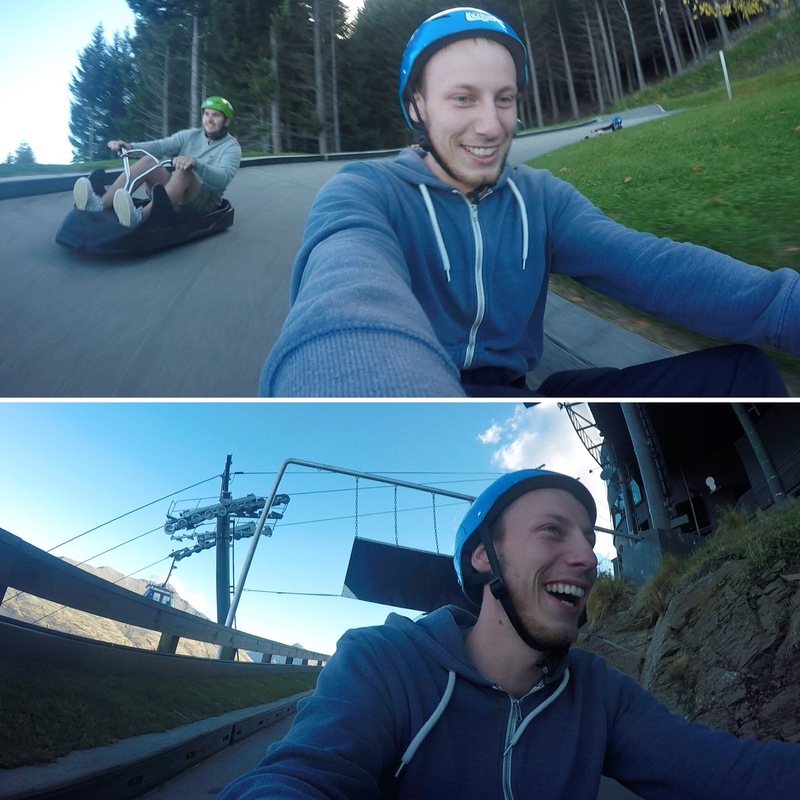 It was really good fun and you would lift off the seat or lift up the wheels sometimes when you went over the hills! Niall also won that race. On the 3rd and 4th race Niall raced the lads which they all took VERY seriously. 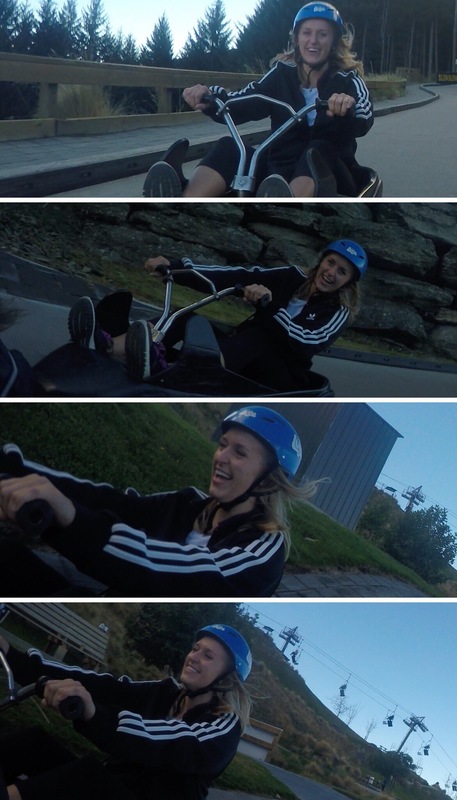 In the last race, I went down with the girls and Niall crashed again, but still managed to nearly win. 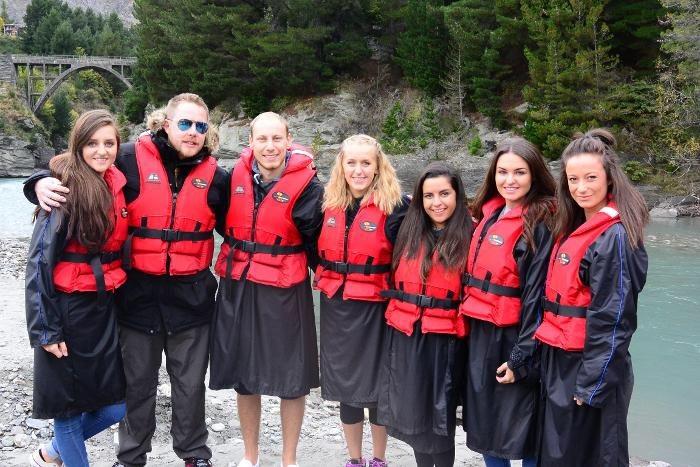 We both really really enjoyed it and it’s probably one of our highlights from Queenstown, especially because we had such a big group to do it with. 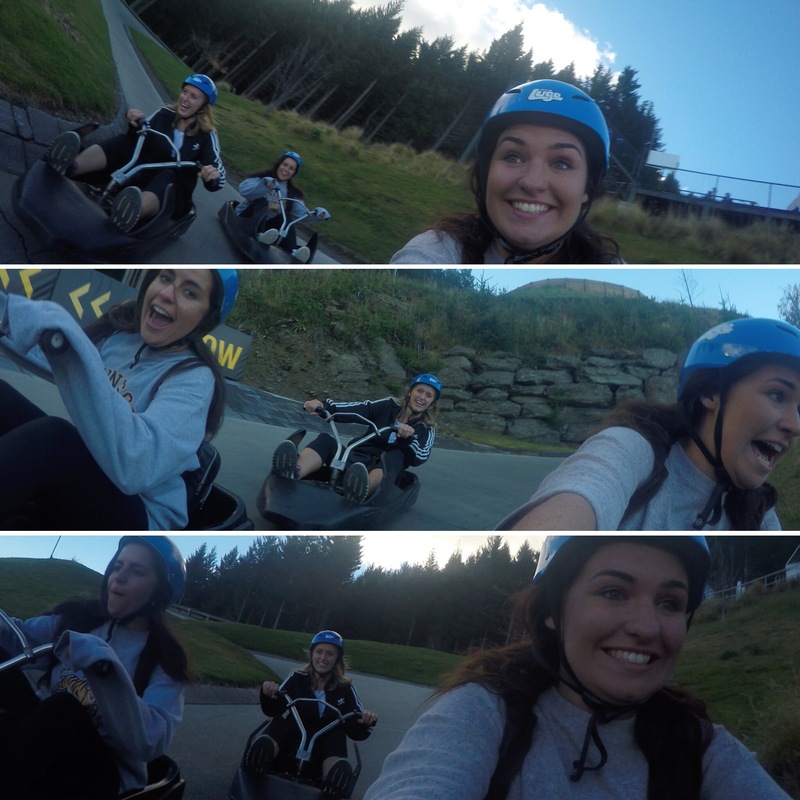 I’m so glad we had the group we did for the luge as I don’t think it would be as fun with only a small group of people. 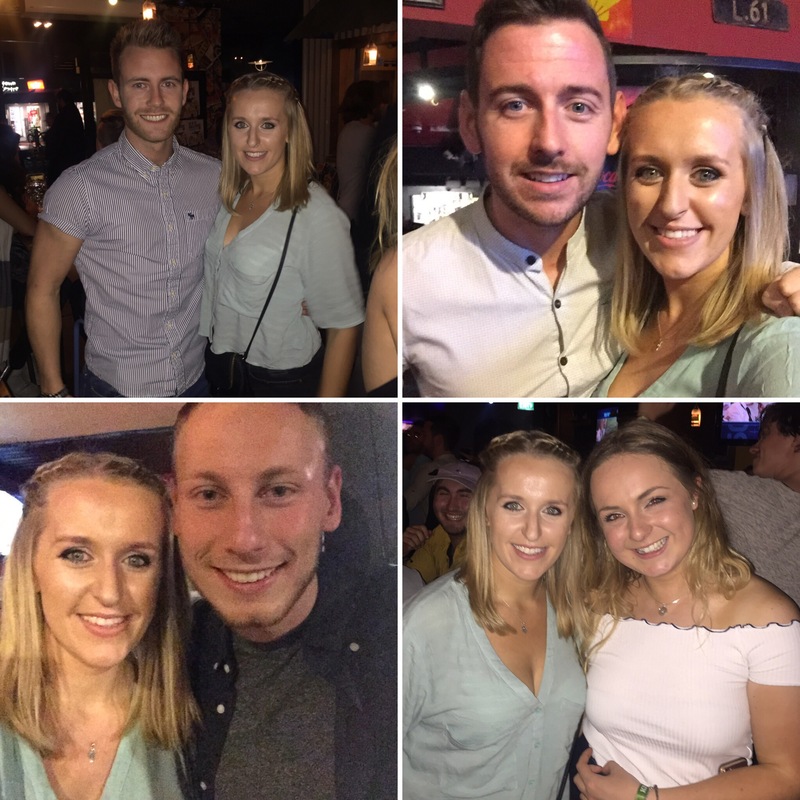 We all went back to the hostel and, while I chilled with the girls, Niall went to the pub with the lads and entered a pool competition with Padraig. 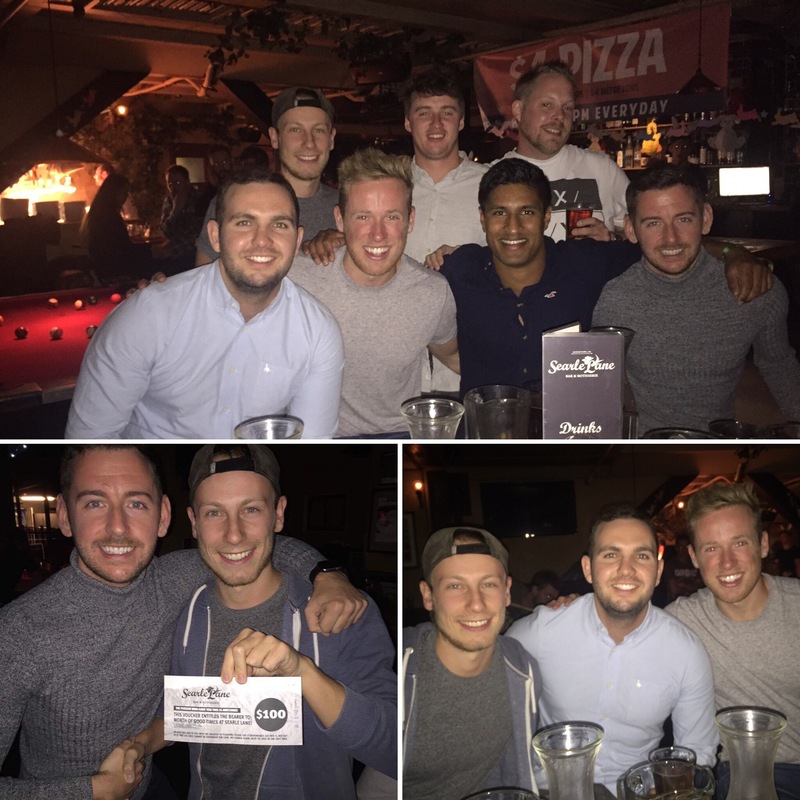 They ended up winning the whole thing and won a $100 bar tab!! 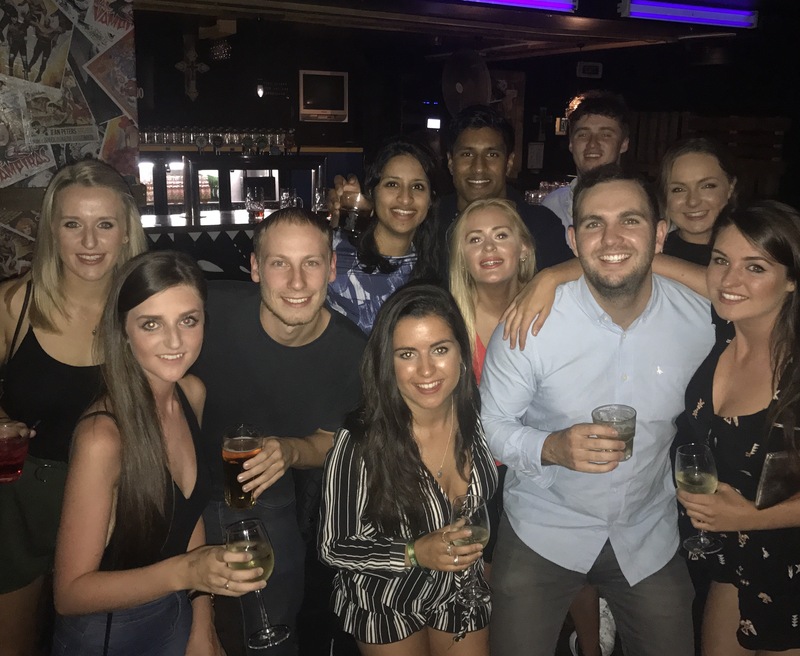 They were buzzing and decided to save it for another night where they could exploit the happy hour at the bar so that we could all get more drinks. It was Easter Sunday so nowhere was selling alcohol and the clubs didn’t open until quarter to 12 or serve alcohol until midnight. 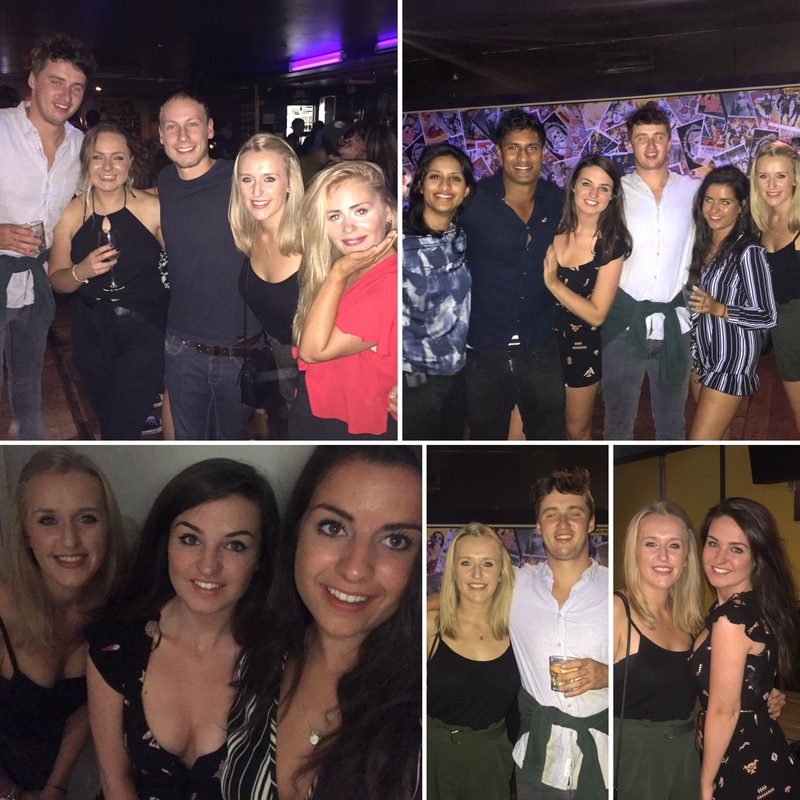 It was Sam’s last night with us before he would be flying home so we all went out and made the most of it despite the limit in alcohol! 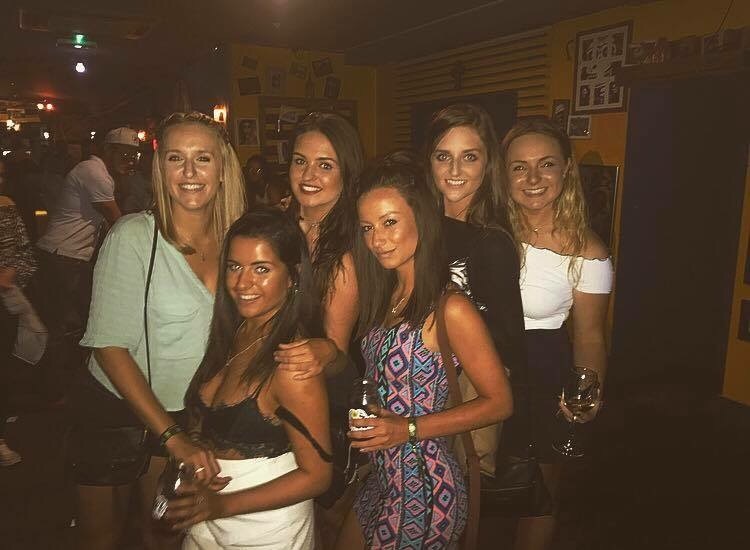 We all still had a good time and me and Niall also saw people who we travelled the North Island with which was also really nice. 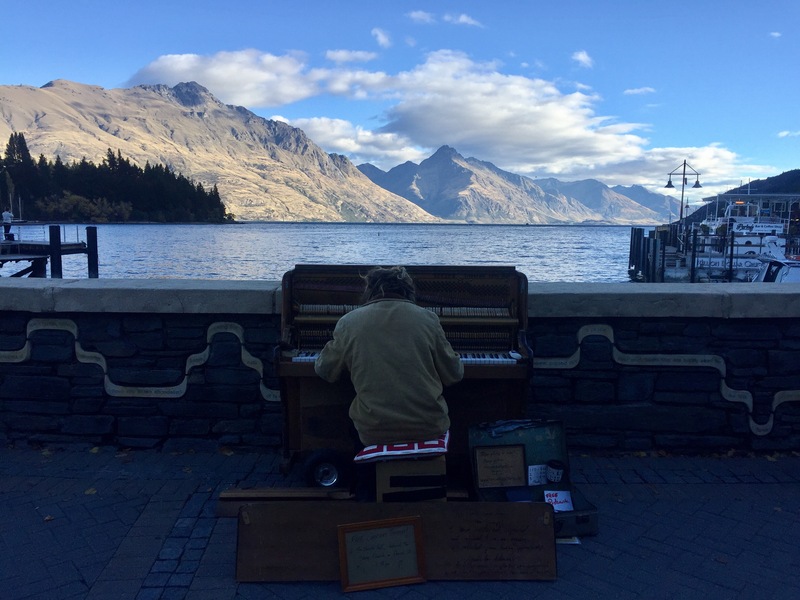 So far, our time in Queenstown couldn’t have been better!